Tipperary boss Peter Creedon is confident the Premier County will close the gap on Kerry. Peter Creedon is backing Tipperary to deliver a big performance against Munster and All-Ireland champions Kerry. 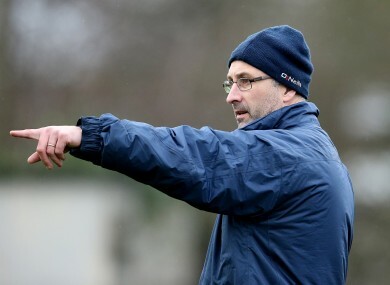 TIPPERARY SENIOR FOOTBALL boss Peter Creedon was a helpless spectator in Killarney two years ago when Kerry hammered his team by 17 points in the Munster football championship. But Tipp have taken giant strides since then and the general feeling is that they can at least beat the +6 handicap betting on offer with the bookmakers. In Creedon’s eyes, Kerry remain the best team in the country, with a penchant for getting the job done no matter what the circumstance. They were pleasing on the eye in last year’s Munster final romp against Cork, for example, but toughed it out later in the season, particularly in the gritty All-Ireland final victory over Donegal. “The more you study Kerry, you start to realise that they train probably harder than anybody else,” says Cork native Creedon. “They’ve obviously got quality footballers and they’re well managed and well coached. “It’s not a fluke plus they have massive tradition behind them as well. “Their performance against Cork in the Munster final was superb. Obviously the Mayo game could have gone either way and in the All-Ireland final Colm McFadden’s ball hit the goal post at the end. “But they were good and what Kerry are good at is figuring out how to play the opposition on a given day. “They can kick the ball, handpass the ball and that’s the challenge of playing them – they’re probably the best team in the country and they’ll probably to continue to be so in the years ahead. Tipperary haven’t beaten Kerry in senior championship football in 87 years and the last time the counties met, the Kingdom dished out a 2-19 to 0-8 hammering. “The reality is that if you beat Kerry, you probably win an All-Ireland!” Creedon smiled. “Tipp haven’t done that in a long time, 17 points in it two years ago down in Killarney and it was fairly embarrassing. We want to put that right this year by putting in a good, solid performance and seeing where that takes us. “We competed with Cork last year, with Galway even though we didn’t play as well as we possibly can and we competed with Armagh this year so we’re showing that there is a bit extra in us than might have been there a couple of years back. And Creedon insists that while Tipp won’t compromise their own attacking philosophy at Semple Stadium, it must be tempered with realism. “I think you have to have confidence in what you’re doing yourself. Longford came and parked the bus against us last year, which I find quite strange. “They put 15 men behind the ball and we won by 17 points. They changed this year (against Dublin). “The thing with Kerry, and I know from playing them a lot, is that if you go overtly defensive, they’ll figure out a way and genuinely speaking, we won’t be stupid, we’ll mind the house. It will be about how we use the ball will be the determining factor. Email “'17 points in it two years ago in Killarney was fairly embarrassing'”. Feedback on “'17 points in it two years ago in Killarney was fairly embarrassing'”.